determine that fungi are more closely related to animals than plants. smaller molecules that can be by the hyphae. glycogen, another similarity between fungi and animals. The most important nutritional characteristic that A. muscaria possesses has to be the symbiotic relationship it forms with trees known as ectomycorrhizae. This is a characteristic found throughout the phyla Basidiomycota. Through this relationship, both A. muscaria and the host tree benefit. 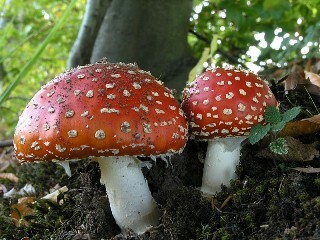 The host supplies A. muscaria with sugars produced via photosynthesis. In return, A. muscaria provides the host with increased surface area to increase its water uptake and aids the roots in absorption of vital nutrients such as phosphorous and nitrogen. I will go into more detail about ectomycorrhizae and its structure in in the adaptations page. But before we look at the adaptations A. muscaria has developed, take a look at the methods it uses for Reproduction.